The classic combination of broccoli and cheese--in pizza form! 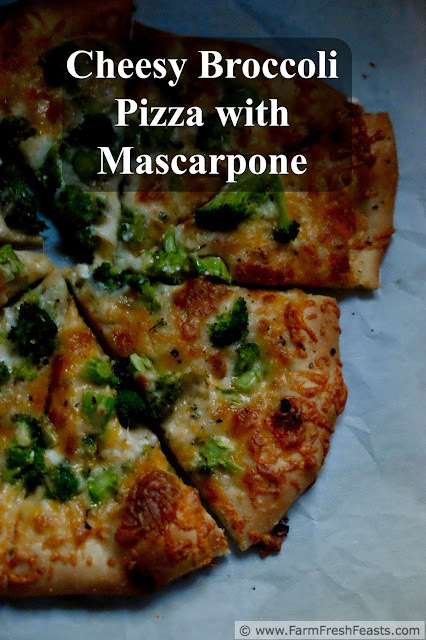 With a creamy layer of mascarpone cheese on the crust, this pizza lets the beloved flavors of broccoli and cheddar shine through. On Friday nights I make at least two pizzas. One is usually a vegetable-topped vegetarian pizza for my spouse, the other is something I know the kids will eat. Rarely do I make a pizza exactly the way I want it [but when I do, it's My Deployment Pizza--why is it that I'm comfortable putting my wants last?] however I generally like every pizza I make. I'd better like it, since we have pizza weekly! I'm always looking for ways to incorporate vegetables into our meals, partly because I want to use up the contents of the Community Supported Agriculture (CSA) farm share box and partly because vegetables taste good and are good for you. No nutritional advice I've ever seen tells you to cut back on carrots or celery, you know? So it seems to me that increasing the amount of vegetables in my family's diet is a worthwhile goal. 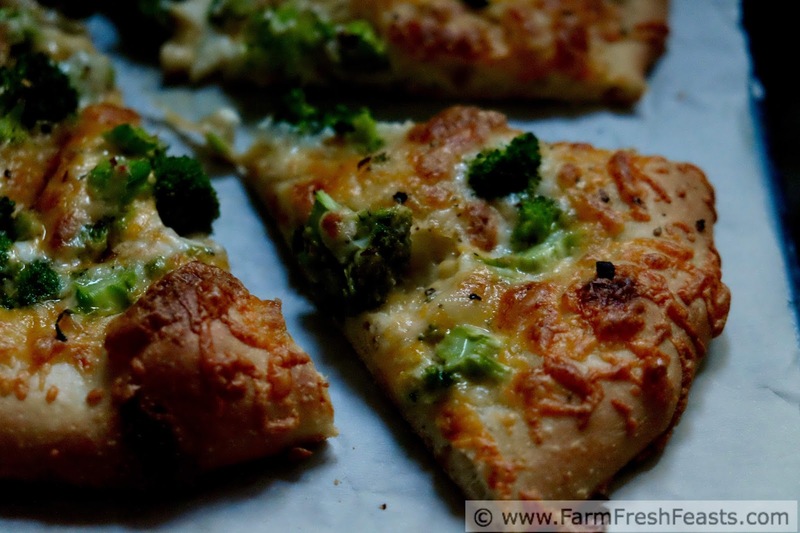 Broccoli is a pretty tame vegetable pizza topping from my perspective, but I realize I'm kinda out there. 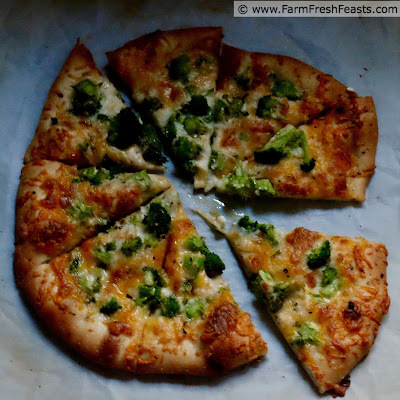 Honestly, if you're making pizza every week and you have vegetables to use up, you'd be kinda out there too. I think broccoli is a good bridge between fresh tomatoes like my Tomato Basil Pizza and shaved kohlrabi like my Shaved Kohlrabi with Meat (or No Meat) Pizza. Last year I put up a large amount of chopped broccoli (blanched, then frozen) for use throughout the off season. It's one of the ways I feed my family from the farm share year round. Using mascarpone cheese as a pizza crust spread is something I learned from my nephew. It provides a subtle creaminess here, and allows the whole 'broccoli & cheese' topping situation to shine without distraction from other sauces. Other pizzas I've made using mascarpone cheese are Heirloom Tomato and Mascarpone Pizza, Fresh Pineapple and Shaved Ham Pizza, Onion & Mascarpone Grilled Naan Pizza, and Meatball Marinara Mascarpone Pizza. Keep mascarpone cheese in the back of your mind, and when you see it marked down at the grocery store why not pick up a tub? For more recipes using broccoli, please see my Broccoli Recipes Collection. It's part of the Visual Recipe Index by Ingredient, a resource for folks like me eating from the farm share, the farmer's market, the garden, the neighbor's garden, and great deals on ugly produce at the grocery store. 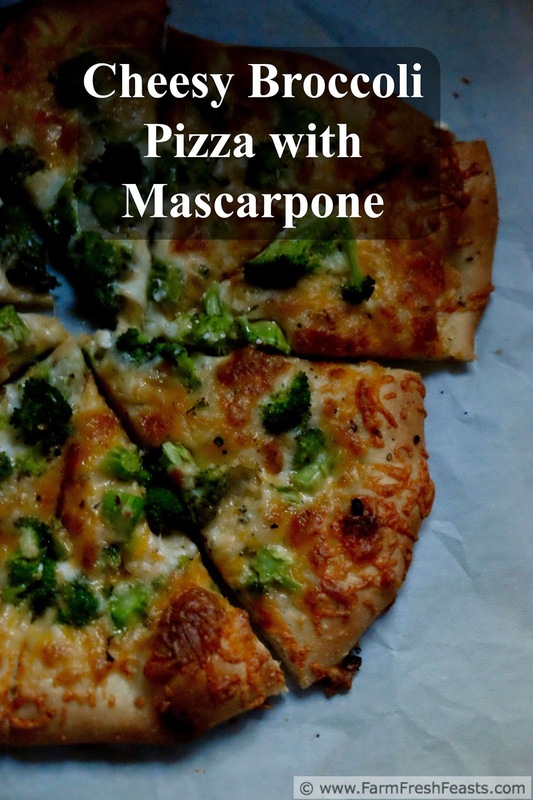 If you need more pizza recipes, please check out my Visual Pizza Recipe Index. I'm sharing more recipes on my Pinterest boards, follow me there. If you like a good peek behind the scenes like I do, follow me on Instagram. Need a good read? I'm sharing articles of interest on my Facebook page, follow me there. Want to know How to Use This Blog? Preheat oven to 450 degrees Fahrenheit. Spread a bit of oil on a piece of parchment paper and stretch the dough out into a shape that works for it today. If you've got a baking stone, keep it in the oven and preheat it please, otherwise use a cookie sheet. Brush crust with olive oil. Spread mascarpone cheese on top of the crust (I find an offset spatula works great). Top with shredded cheeses. 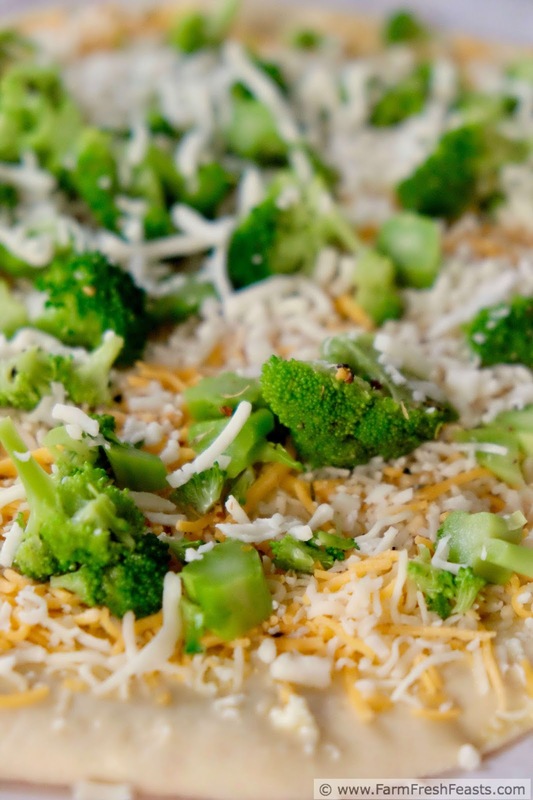 Scatter broccoli atop cheeses, and season with lemon pepper seasoning. Slide entire pizza (parchment paper and all) into the oven. Bake for 5 to 8 minutes, then shimmy the pizza off the parchment paper and bake directly on the pizza stone (or cookie sheet) for another 3 to 5 minutes until the cheese is browned and bubbly. Slice and serve. Veggies are good. Did I tell you Ave loves asparagus? Like she pops the little pieces like their M&M's.